Waters’ comments were the strongest criticism yet from a Democrat over the controversy that continues to grow. Rep. Maxine Waters, D-Calif., called on President Obama on Friday to explain what happened when a provision was added to his economic stimulus bill last month that allowed AIG employees to receive $165 million in bonuses. Waters’ comments were the strongest criticism yet from a Democrat over a controversy that continues to grow. Sen. Christopher Dodd, D-Conn, confessed Wednesday to adding language to a spending cap in the stimulus bill that specifically excluded executive bonuses agreed to before the bill’s passage. But he added that Treasury officials forced him to make the change to protect the government from potential lawsuits. It was a reversal from Dodd’s position a day earlier, when he strongly denied he had anything to do with adding the provision. “They’ve got some explaining to do,” Waters told Joe Scarborough on his WABC radio show Friday morning. “And I think the president is going to have to clarify to the American public what took place between Treasury and Mr. Dodd. The provision added to the stimulus bill was a broad measure that applied to all companies receiving bailout money, not just AIG, though the AIG bonuses in particular have caused outrage in Washington and around the country after the insurance giant received more than $170 billion in federal aid. The U.S. government now has an 80 percent stake in the company, which was hit hard by the downturn in the housing sector and by the failure of complex securities based on risky mortgages. California’s Democratic Congresswoman Maxine Waters says Treasury Secretary Tim Geithner knew or certainly should have known about the Treasury’s approved bonuses for AIG employees. She says President Obama must not have heard the full story on what Geithner knew and when he knew it. Ms Waters was interviewed by Fox News. The far left and liberal Waters has always been seen as a strong supporter of Barack Obama. Her criticism of Obama Treasury Secretary may mean that other Democrats are tiring of Geithner and perhaps the president will be moved to replace him if enough Democrats speak out….. Waters herself has been under fire. Rep. Maxine Waters’ reelection campaign lent $25,000 last August to a nonprofit run by the California Democrat’s daughter, according to campaign finance records. The funds were used to underwrite the costs of events at the Democratic National Convention in Denver, a campaign official said. 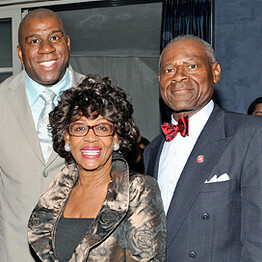 Waters herself serves on the board of the nonprofit group African-American Committee 2000 and Beyond, the lawmaker’s financial disclosure filings show. Sidney Williams, the congresswoman’s husband, has also been a director of the nonprofit, according to recent tax filings for the group. You are currently browsing the archives for the Maxine Waters category.